Have you spotted our 18th-century horse-drawn Mail Coach on your visit? Read on to find out why its wheels are missing and what it takes to build new ones. How can wheels get damaged? The life of a horse-drawn carriage, with wooden wheels, is very hard. The knocks and strain caused by poor road surfaces can be immense. Our Mail Coach has been run on the road many times over the years and this has affected the wheels. They have also dried and shrunk over time. This is a normal process with horse-drawn vehicles, most of which require new wheels to be built and fitted during their life. If particularly long-lived, wheels can be changed or rebuilt many times. The steel tyres also need to be replaced as these wear out. The 18th-century horse-drawn Mail Coach almost looks like new but if you took a closer look you would have noticed some cracks. 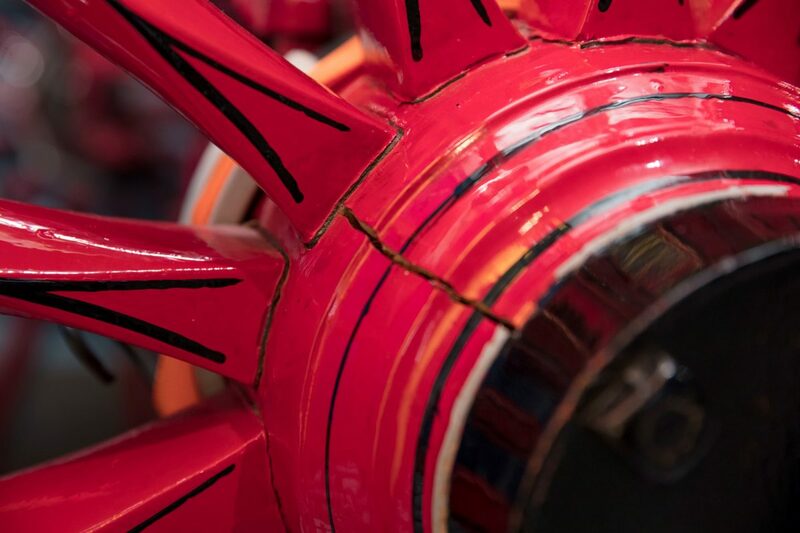 Now, thanks to generous support from The Pilgrim Trust, The Leche Trust, Mr Graham Buckland, the London Museum Development Measuring Up Programme, and other individual donors we will be able to restore the wheels to its former glory. The new wheels for our Mail Coach are being made by Fairbourne Carriages – a family run, specialist coach works based in Harrietsham in Kent. They are constructing new wheels and hubs for our Mail Coach using traditional methods, tools and materials. On the early morning of 18 March, their team visited The Postal Museum to start the project by removing the wheels from The Mail Coach. 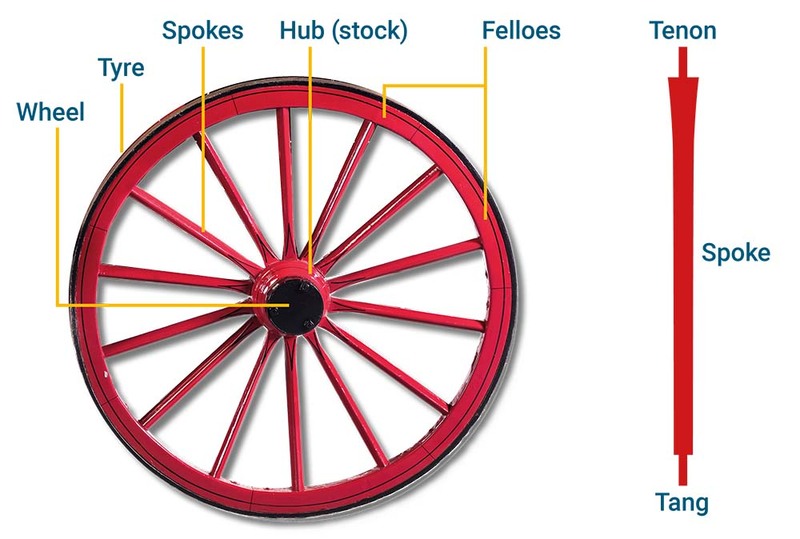 Building a wheel for a Mail Coach or other horse-drawn carriage follows a traditional process. Wood for the wheels (spokes, felloes and hubs) is cut roughly to size and allowed to dry. The wheels from our Mail Coach are now in the Fairbourne workshops where the wheel boxes have been pulled out of the hubs (stocks) and the wheels carefully measured. The spokes (made of oak) are cut and shaped to size and the new hubs (made of elm) shaped on a lathe using the original hubs as a pattern. Holes are cut in each hub to accept the new spokes. The process of driving the spokes into these holes is known as ‘knocking up’. With the newly ‘knocked up’ wheel, the tangs are cut onto the spoke ends to accept the new wheel ‘felloes’ (made of ash and pronounced ‘fellies’). The felloes are driven onto the spoke ends and held in place with a small wedge. Following this, a new steel tyre is rolled and cut to size. The circumference of the tyre is slightly smaller than the outer circumference of the felloes. Once welded, the tyre is heated and dropped over the felloes, then quenched with water and allowed to shrink, tightening the whole structure of the wheel. This is an exciting and crucial moment in the rebuild process. With the tyre fitted in place the hubs are then bored out internally. The wheel boxes are fitted and held in place with small wedges that allow the wheel to be ‘trued up’ with, hopefully, no wobbling! The finished wheel is sanded back around the joints ready for the next process – painting. This is a drawn-out process that can be as many as 20 coats, with lengthy drying times between applications. It is expected that the entire rebuild of new wheels will take around six months to complete. 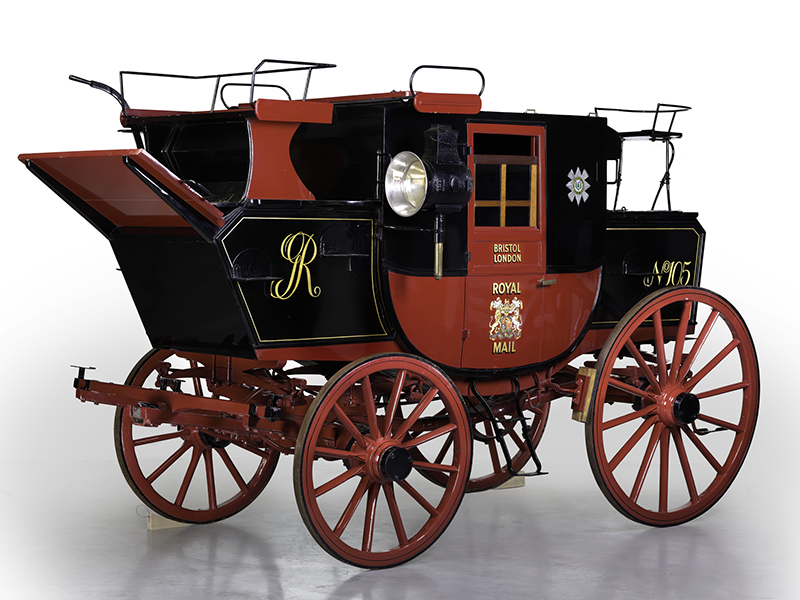 Take a whistlestop tour through the curious and dangerous history of British mail coaches online or visit our exhibition to see various tools and bits from c.1900 alongside the wheel-less Mail Coach. These would have made wheels back in the day and are still used today. Similar tools will be used to make the new wheels going on our coach.